History: Robert Drake was born into a working class neighborhood in South Boston, Massachusetts. His father, William Robert Drake, was a dock worker and his mother, Beatrice Drake, was a career waitress. Growing up his family never had a lot of money. The constant rigors his parents had to go through to make ends meat often left them tired and lethargic. While they still tried to instill in Bobby a strong work ethic, more often than not he craved an outlet for fun. He often found this outlet playing around his neighborhood, making friends, and going on his own little adventures. This made him somewhat of a mischievious child, who always seemed to be on the lookout for a good laugh. But he never became overly devious. Throughout his younger years and early teen years, Bobby fit the mold of a typical outgoing teenage boy. He made many friends in school and developed a knack for getting laughs from his peers. He was never a straight-A student and didn't always balance his work and play. He still showed a knack for handling numbers, but was never really passionate about deeper subjects. As time went on he developed and even greater taste for adventure, getting into extreme sports like snowboarding and free-running. By the time he was 15, his appetite for thrills finally caught up to him. While at school, he and his friends snuck onto the roof where they used materials from the school gym to construct a sledding ramp. Bobby was the first to try it out, but it all went very wrong when the ramp failed and Bobby skidded into a nearby pond. At this moment his mutant powers manifested. His body suddenly formed a powerful ice-shell and froze the entire pond solid. Shocked and scared, Bobby tried to run back into the school. As he did, his powers only expanded and he ended up freezing a good portion of the school. This incident caused a major panic. When it appeared that Bobby couldn't stop freezing everything around him, his peers turned on him and tried to chase him away. He ended up settling into an old apartment building that he eventually froze as well. This led the police to him and after some coaxing from his parents, they got him to come out. And once he finally settled down, he stopped freezing everything around him. While Bobby was okay from the incident, it deeply affected his life. His friends were too afraid to go near him anymore and the school expelled him for his stunt. The school even threatened to sue the already poor family, which would have put them in even greater peril. Thankfully, a man named Charles Xavier came to their aid. With the help of Xavier's lawyers, the school dropped the charges. He even wrote a check to repair the damage done to the school. But he was unable to reverse Bobby's expulsion. As a result, Professor Xavier offered Bobby a chance to go to school at the Xavier Institute. It was an offer Bobby eagerly took. Once at the institute, Bobby quickly took to the world of the X-men. He learned to embrace his new powers and they quickly became his outlet for fun. He also played a major role as part of the X-men. 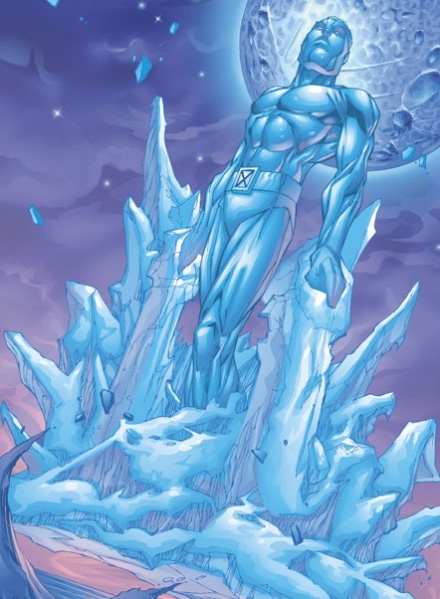 His adventurous spirit fit in nicely with the X-men and he quickly became a dedicated member of the team, even though he still had a tendency to joke around. Character Breakdown: Bobby Drake grew up in a very serious environment with very serious parents. There was little to joke about early on. His parents were always working and to him, they always appeared exhausted and miserable. Even though they tried to teach him the values of a good work ethic, Bobby needed more. That's why he sought an outlet. This desire plays a significant role in his personality because it pre-disposes him towards thrill-seeking tendancies. He's more willing than most people to take a chance on something for fun rather than go the safe route. It was in some ways his only means of expressing himself early on because his family didn't have a lot of resources. In addition to seeking thrills, that willingness to take a chance also plays a part in him being a jokester. Just as he needs a good thrill, he needs a good laugh as well and he's more than willing to be a little mischievious in doing so. This is his way of making live more exciting because to him there just isn't much out there for a guy like him. He's not the smartest guy in the world and his phsycial skills in most respects were nothing special. So he had to make good use of whatever talent he did have and his fearlessness in many ways was his greatest talent. Eventually, his mutant powers superceded that talent. Once they manifested, it seemed like one thrill too many. But when Professor Xavier gave him a chance to use these powers, he embraced them. And just as he did before with his thrill-seeking, he sought to make good use of his newfound skills. This in many ways is what makes him such a strong fit for the X-men. Part of Professor Xavier's principles include helping mutants use their powers for the greater good. Bobby best embodies this spirit because he's always had a strong drive to utilize his skills. Add this to the work ethic his parents championed and he is someone who will take big risks, but still have a firm understanding of right and wrong. His love of adventure, his ethical background, and his love of humor come together in a solid overall framework of his personality and identity. He is someone who is willing to put himself out there to make a difference, even though he doesn't always take the task as seriously as he should. He still managed to contribute on many levels and the nature of his contributions may yet change. Since Bobby is still growing into adulthood, his character and psychology are not fully formed yet. While his lack of maturity may be somewhat innate, his growth as a person has yet to settle and he is still establishing an identity both as a mutant and as one of the X-men.